This general has a bodyguard of loyal spear-armed and armoured cavalry to accompany him onto the field. Hail stratege! Before you are your bodyguards. They will follow you into the thick of battle to protect and fight for you. Their training, discipline, skill, and tenacity in battle is par excellence exceeding most nations and states. To this end they ride the finest horses and don the finest equipment. They will serve you with alacrity and will only fail in the most trying of circumstances. Trust them with your life for they will help in bringing victory. 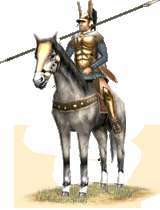 Historically, the cavalry bodyguards of the Diadochoi were easily counted amongst the best cavalry in the world. They were the direct descendants of the Companions of Philippos and Alexandros, but overtime became more heavily armored due to the prevalence of missiles in Asia and constant fighting amongst the successors. Between the three remaining major successor states the bodyguards went by different titles. In Antigonid Makedonia they were still known as Hetairoi and in Ptolemaic Aegyptus as Basilike Ile. However, in the Seleukid east there were two contingents: the Hetairoi made of military settlers and the Agema made of local nobility and mainly coming from Media. Unfortunately, over time the cost of maintaining such a unit and finding the men who could fulfill their own financial qualifications became more difficult and their numbers shrank considerably. Only the Seleukids could maintain its force of elite cavalry, which then too dwindled in the face of constant dynastic infighting between branches of the family and usurpers.